Vegetables are typically grown in the ground or in containers. But why grow vegetables in containers when you could grow them in the ground? There are some good reasons, including access to tools, back-saving reasons, and the ease of management of a few containers rather than a full in-ground garden. There are reasons of necessity, such as availability of space, too. Many fall and winter vegetables can be grown in containers as long as they receive water, fertilizer, and the appropriate space. 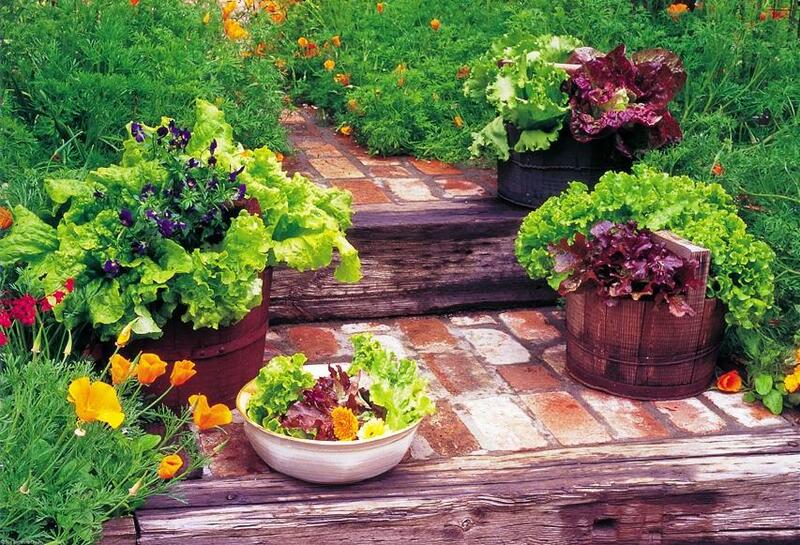 Let's talk about a few steps for growing lettuce, cabbage, radishes, and mustards successfully in containers. Find a sunny location. Be sure excess water is allowed to flow out of the container. Use an appropriately-sized container. Fill containers with potting media. Overfilled pots will let water runoff quickly; under-filled pots will reduce the effectiveness of the pot size. Water enough to keep soil moist but not soaking wet. Use a mulch on top of the media, but don't apply mulch until seedlings are four inches tall. Remove weeds as they appear. Check plants daily to control insects and disease; check under the leaves. Protect seedlings from cold damage. What if you made it your mission to incorporate at least one item from your vegetable garden into at least one meal every day? This is easy to achieve with your fall and winter vegetable garden thanks to the vast amount of greens and lettuce that can be grown during these months. Growing plants in containers allows us to grow them in places where there isn't soil like on our porches, decks or patios. Though September is often still hot, gardeners are beginning to anticipate cooler weather. It's now we start to focus on planting cool season vegetables that will grow and produce during the fall, winter, and spring. September is a transitional month, with cool season vegetables going into the ground as warm season vegetables are remain in the garden. September is an odd month for planting the vegetable garden. It's right between the warm season and the cold season. What do we do? This is a transition month. This is when we plant some warm season vegetables and some cool season vegetables. In the early part of the month, we can plant transplants of tomatoes and peppers. We can also plant squash, cucumber, pole beans, snap beans from seed. September is the time when vegetable gardeners anticipate the cool weather to come. Now is the time we focus on planting cool season vegetables that will grow and produce during the fall, winter, and spring. This is a transitional month, however, and warm season vegetables are still in our garden.